Our anniversary (Sarah and me) was yesterday–33 years of working together to make it happen–and we’re succeeding! As much as we enjoyed the day, including our date night out at Fezzo’s Restaurant, our best present was our first gmail videoconference with Ann, whom we sent off last Monday bound for China. No long distance, no phone bill. It’s almost too simple–too good to be true. But it’s true! Between the built-in cameras in our iMac and Ann’s iBook, we can see and hear each other in real time with quality graphics and sound. 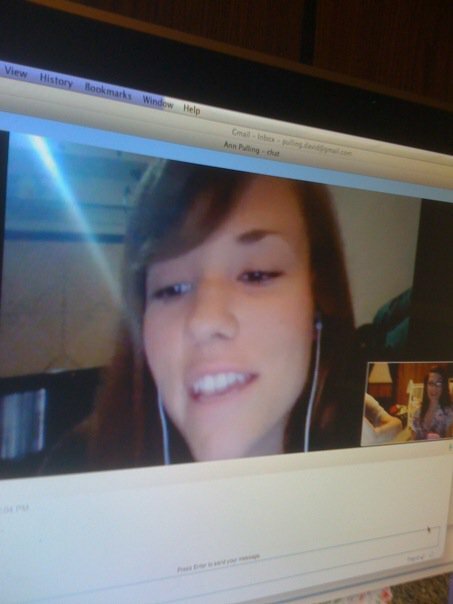 If I have to send my daughter around the world, at least I have this technology to stay in touch. Republican Governor Bobby Jindal and democratic activist James Carville are as politically opposite as I can imagine. But what brings them together? British Petroleum’s culture of lies, obfuscation, and misrepresentation. Like the commentator on CNN’s Anderson Cooper 360 tonight, we Louisianians are hung up somewhere between praying for BP’s success at killing the well and suing BP for its corporate hide. Truly, we do pray for BP’s success at shutting in the well (I certainly do!). But I also trust God for justice: May BP pay for the hell they have unleashed! Mom and daughter gaze across the expanse of Old Man River on our last evening together before Ann's striking out for the Orient. As of posting, we’re still waiting for word from daughter Ann that she arrived safe and sound in Guangzhou, China, after flying over the North Pole from New Jersey to get there. We have faith that all is well, the lack of communication notwithstanding. 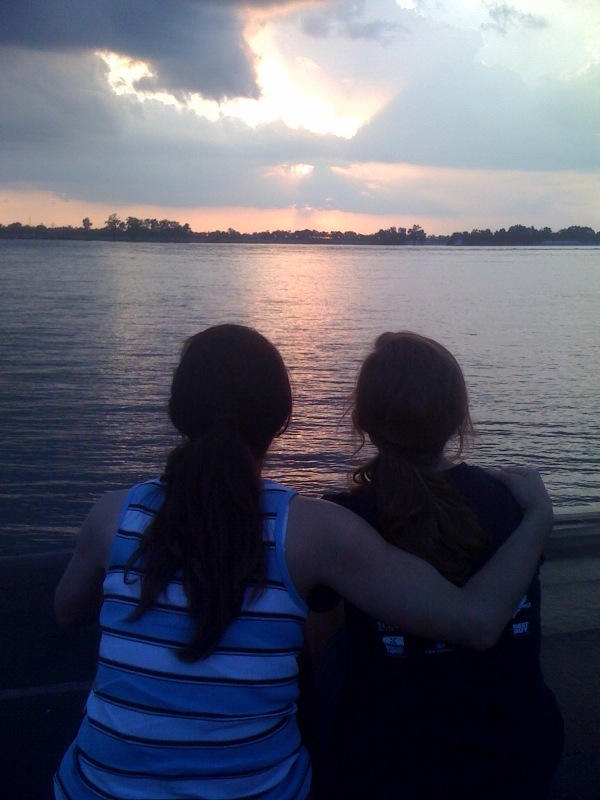 The picture of mom and daughter I took our last evening together in Baton Rouge, looking westward across the Mississippi River as sun set, is one I’ll covet. They looked past our home (Eunice, 80 miles or so that direction); past the US West Coast Pacific Coast; and toward the direction of Ann’s destiny, China, on the following day. In a sense, “sun set” was a bad metaphor. “Sunrise” on the dawning adventure would have been so much more exciting. But “sunset” was appropriate that evening. Because what happens at sun set? We rest from our day’s work. And on this Sunday we rested from months of preparation and planning, knowing that the bags were packed, and on the morning after the night of rest, we would set the plan in motion. And so we did. More to come on this subject in the weeks that follow . . .
We spent the day at the Morris’s after they brought him home from the doctor–diagnosis, renal failure; prognosis–terminal. It was amazing how quickly he was going down–he was fully ambulatory when he went to the hospital, and even right after he got home about midday, but by 4 or 5 he had gotten so weak that Sarah’s brother had to practically carry him back to his recliner from the bathroom–he was so weak he couldn’t put one foot in front of the other. But as God’s grace would have it, and as an answer to a family prayer meeting, by 8 or 9 he had regained considerably, both in physical strength and cognitive coherence. He ate most of a baked potato without getting nauseated (the only thing he’s eaten all day), was getting by without any pain medication (amazing! ), and when the pastor and his wife called a little after nine, he shot up out of his chair with the same energy and enthusiasm to receive the company the same as he would have six months ago. I started to steady him when I saw him rise out of his chair, afraid he would fall, but I realized right away that he didn’t need any assistance–It really was a “sign and wonder,” considering how weak (and incoherent) he had been a few hours earlier. We just left a while ago. Sarah’s brother is going to spend the night just in case, but I’m sure not concerned like I was this afternoon–It really looked like the end was within hours. We got a little divine reassurance for sure, and we pray for him a good night’s rest and much more beyond that. 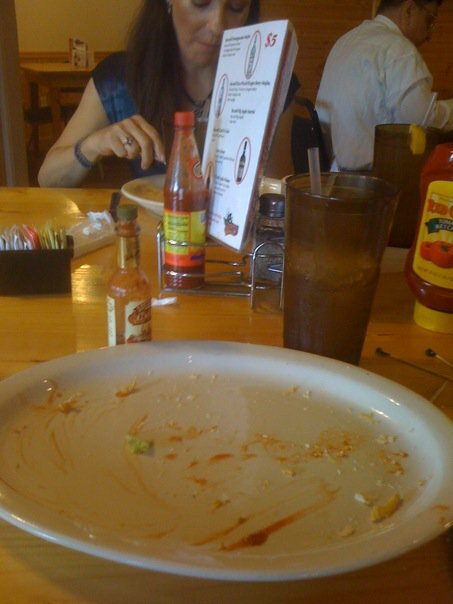 The empty plate at Rocky's signifies the oyster po'boy was too good not to eat. But does this empty plate signify the future of oyster po' boys? All my life as a Louisianian, I have taken seafood “for granted.” Oysters, shrimp, crabs, Red fish, Croakers, Speckled Trout, and on and on. In childhood, fishing and crabbing were sport, family recreation, and at the end of the day, good eatin’ with Zatarain’s crab boil or fish fry to give our dishes the distinctive Louisiana flavor. Only later, watching one of the news reports on BP’s regional debacle, did it occur to me that what we’ve taken for granted all these years is now endangered. In my imagination, I confronted the sobering reality that one day before long, thanks to BP, that oyster po’ boy might be stricken from Rocky’s menu, or the price raised a dollar or so because the oysters have to be imported from who-knows-where. Paradise Daiquiris looks like it could be the waiting room for the Cajun Lube. Double click to enlarge the photo. 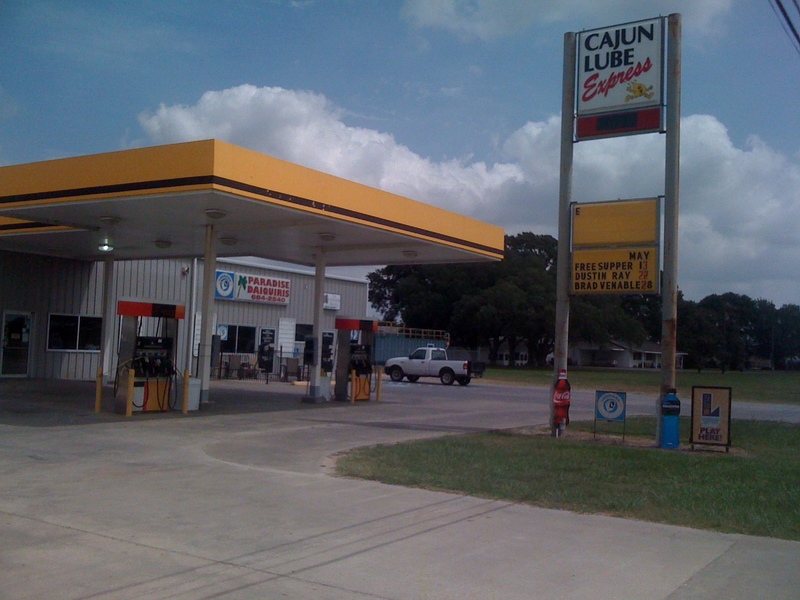 On the southern outskirts of Church Point, Acadia Parish, Heart of Cajun Country, Louisiana, stands the twin business enterprises Cajun Lube Express and Paradise Daiquiris. (Double-click on the photo to see the enlarged details). What goes here? A fellow can tank up with gas, change the crankcase oil, grease the joints, and while he waits, also “lubricate” his inward parts with a high octane frozen beverage–all at one convenient stop! I also noticed Paradise Daiquiri’s phone number prominently emblazoned on the marquis. That must mean you can call ahead for take-outs–Maybe make an appointment for an oil change along with an order for frozen daiquiris to while away the moments while you wait. I’m less and less impressed with BP’s performance on the GOM disaster. 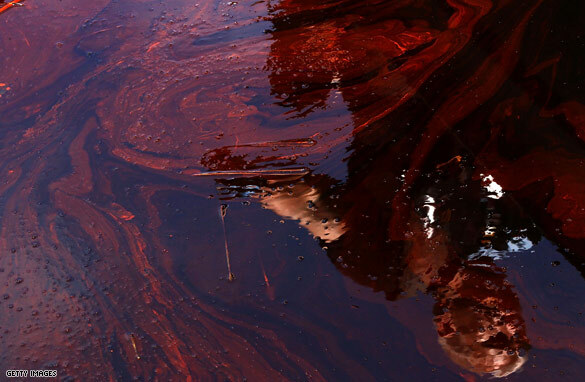 I’m not going to call it an oil spill any longer, because it’s turned into an “oil spilling” in the most urgent present participial sense. How dare they suggest "Beyond Petroleum!" “Beyond Proof”–No way anyone can sue BP, because they’re slimy weasels! “Beyond Price”–Who knows what this is going to cost? “Beyond Pollution”–This event has the potential to redefine pollution. “Beyond Pleasing”–since the event is so disgusting. 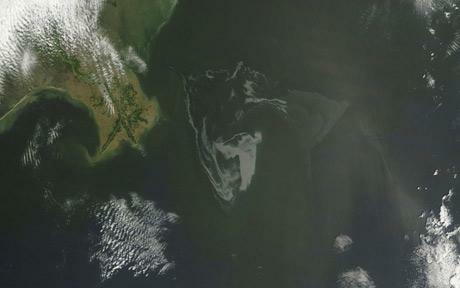 “Beyond Pretense”–since BP is pretending this disaster is someone else’s fault. “Beyond Puzzling”–When/how will this nightmare end? “Beyond Parallel”–Who’s ever seen a mess like this? “Beyond Patience”–Describing my present demeanor in regard to this disaster. Other suggestions, dear reader of this blog? The Angus bull icon alerts the traveler "T'es arrive'." I have to remind myself once in a while how rare and privileged I am to live in the heart of Cajun country, one of the most fascinating ethnic regions in America. 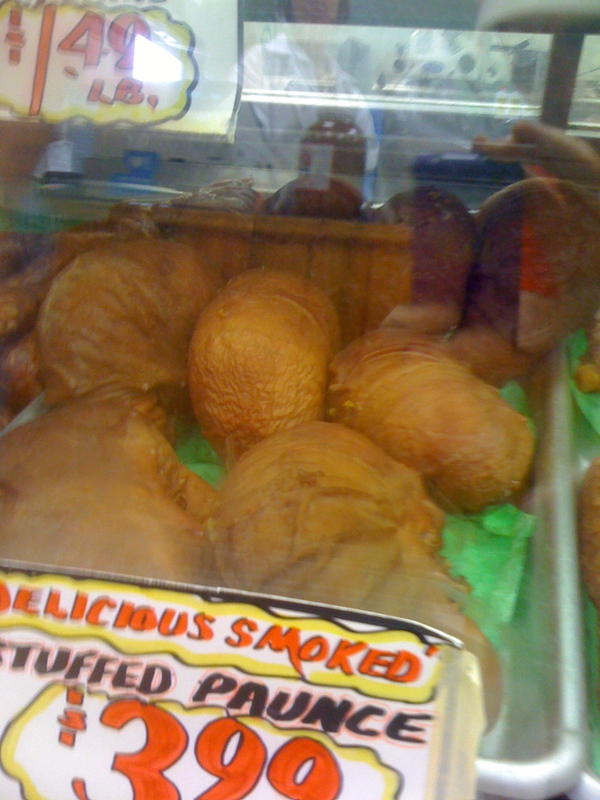 One of the regional hallmarks of Acadiana is the meat market, a local slaughter house that processes its own goods. 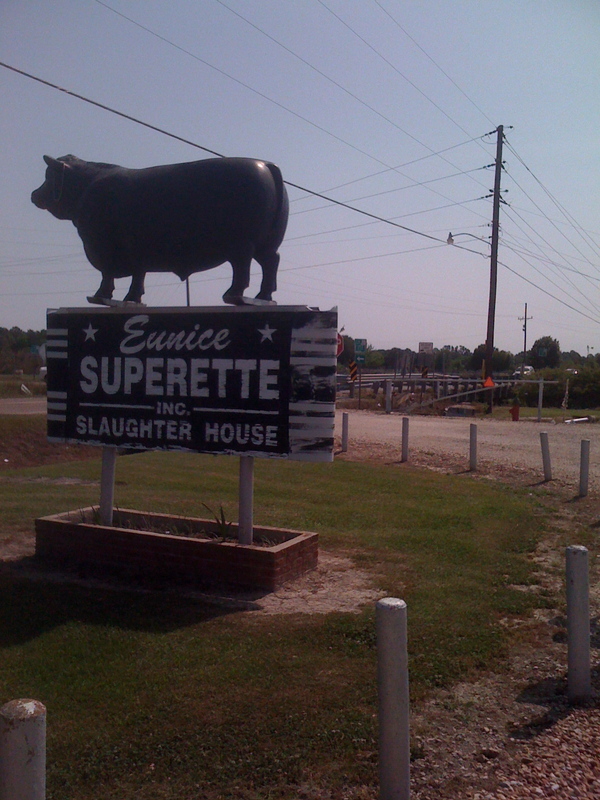 In our home town of Eunice, one enduring “marche’ de viande” is the Superette Slaughterhouse. In former years, the “Superette” was a local grocery store that marketed the slaughter house’s wares. That store has since joined another franchise, but the Angus bull icon on the highway on the southwest edge of town still signals to the traveler that fresh boudin, gratons (i.e. “cracklin’s), and “paunce bourre'” is nigh. What a unique place from which to hale! And what a unique place to eat exotic ethnic preparations like stuffed cow stomach (paunce bourre’)! Ouai, cher, c’est bon de manger les viandes magnfiques de Eunice Superette Slaughterhouse! 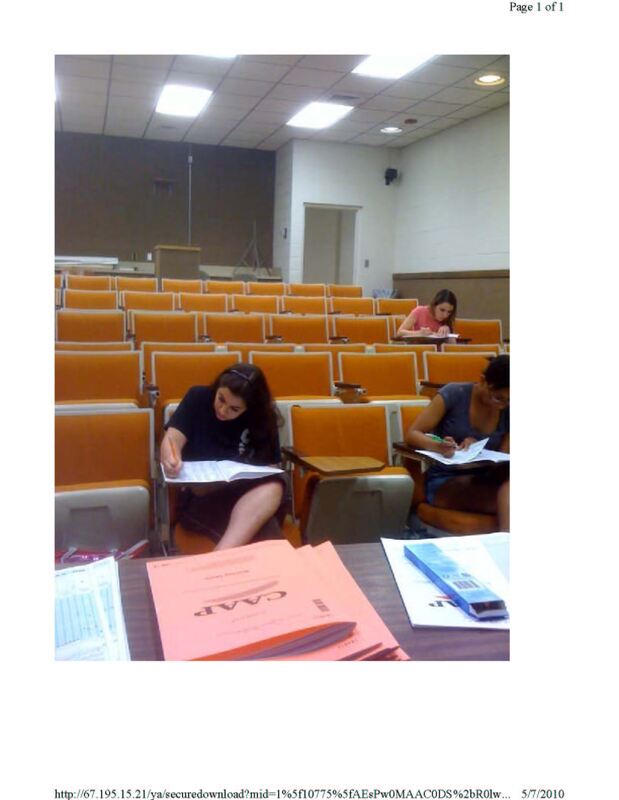 The room grows sadder by the moment as students turn in their work and depart. I’ll miss my 11:00 MWF class from this semester that ended this morning. As students finished their final assignment and the room emptied one by one, a pleasing wave of teacherly sentiment swept across the memory of the months since January when we first met. Teachers, perhaps moreso than others, understand how a gathering of rank strangers at the beginning of a term forges a group identity, or “groupanality,” over the course of their common ordeal. This group’s “groupanlity” blossomed quickly. Before mid-term, they were already endearing. Although they weren’t collectively an astonishingly brilliant group in scholarly terms, they were bright, earnest in attacking their assignments, game enough to take risks, and as a result, easy to teach (and like). As I told them this morning in my farewell message, by far the best three hours out of my workday weeks since January were the MWF 11:00’s we shared together in M108. So here’s to a moment of reflection and nostalgia: To SP2010 ENGL1002.09, may you stay out of trouble, may you seek God above all, and may God bless you along your journey! condolences to me on the condition of our disaster that continues to fester in the Gulf of Mexico as we nervously wonder what’s going to happen and when, how bad it’s going to be, etc etc. Proverbially, we’re hoping for the best, preparing for the worst. So far, we’ve dodged the worst (or it’s dodged us?). But no one takes consolation as the sickening sheen meanders in sloooooooooooow, amoeba-like movements just off-shore, feigning one way now and another way later–keeping everyone off balance from Louisiana to Mississippi to Alabama to Florida. I realized the email message was worth posting after one of my colleagues thanked me for the way I expressed the update to her and my other friends. So I read what I wrote and liked it enough: Here ’tis! We’re so addicted to the hydrocarbon teat that we can’t stop guzzling its poison, even though we freely admit it’s killing us. Maybe this current incident will turn into one of those galvanizing moments in history—I can’t imagine the other big oil companies watching what BP’s going through without realizing this mess could just have easily been theirs, because no matter how bad BP’s environmental record, what happened on that rig could have happened on any operator’s rig. The ridiculous irony is that all this blame-deflecting BP is throwing out is kind of justified (i.e., the contracted rig operator’s equipment truly is what failed). Yep, this “accident” could have happened to any operator in a deep water drilling operation. Oh, the meaning of canaille? How about sneaky? Better yet, “Slippery?” Good synonyms.